The Scalloped Hammerhead Shark has a circumglobal distribution in tropical and warm temperate seas between 45°N to 34°S, but occurs more frequently at higher latitudes during the warmer months. Scalloped Hammerheads may be found throughout the seas around northern Australia as far south as Sydney, NSW (34°S) and Geographe Bay WA (33°S). The Scalloped Hammerhead Shark typically grows to approximately 3.5 metres in length, although there are unconfirmed reports of larger individuals. They are a timid shark and not considered dangerous to humans. The Scalloped Hammerhead is on of 9 species of hammerhead that occur globally. Of these, only 3 species occur in NSW waters – Scalloped Hammerhead, Great Hammerhead and Smooth Hammerhead. The Scalloped Hammerhead Shark can be distinguished by their large flattened 'hammer-like' head, with wide set eyes and prominent central scallop-like indentation in the front margin of the head. 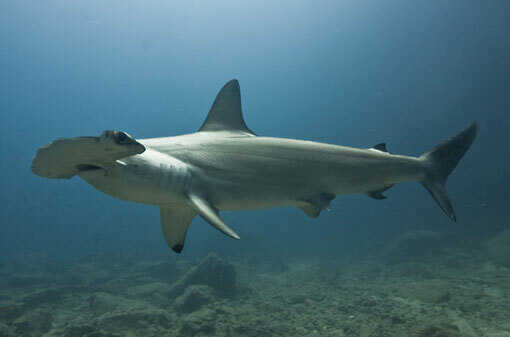 The Scalloped Hammerhead Shark has a tapered shape, with light brown, bronze or olive colouring on the dorsal surfaces, fading to white below. The underside of the pectoral fin tips has a dusky colouration. The Scalloped Hammerhead Shark is often confused with other species of hammerhead sharks, including the Smooth Hammerhead and the Great Hammerhead shark. On Scalloped Hammerheads the narial groove that occurs on the under-surface of the frontal margin of the head is shorter and less developed, while the central scallop is usually more prominent and well developed than on the Smooth Hammerhead. The teeth of the Scalloped Hammerhead are also usually smooth edged, while the Smooth Hammerhead usually has weakly serrated teeth.